"I spent a lot of my money on booze, birds and fast cars - the rest I just squandered." "Pele called me the greatest footballer in the world. That is the ultimate salute to my life." 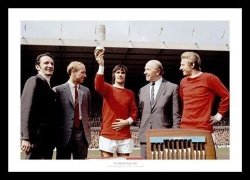 "So George, Where did it all go wrong"
Best is presented with the Trophy. 3 photos of the legend. 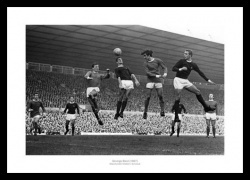 Best rises above Arsenal's Frank McLintock. 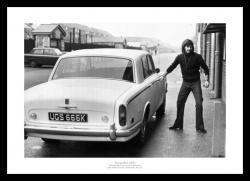 Best arrives for training in his Rolls Royce. 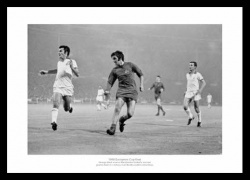 A superb photo of the legend in action. Best scores United's second goal. 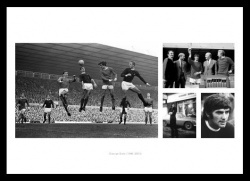 IntoSport's football legends section features George Best print memorabilia in addition to a wide range of football legends photos and canvas prints. 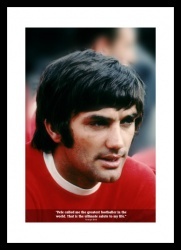 George Best is widely regarded as one of the greatest footballers of all time. 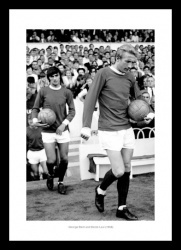 He made 361 appearances for Manchester United, scoring and scored 137 goals. He also represented Northern Ireland 37 times, but his talent was never seen at a World Cup. He tragically died at the age of 59 after battling alcoholism for most of his life. 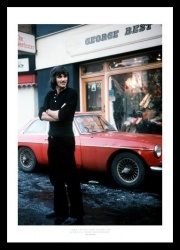 Our George Best prints are available in a range of print sizes and can be bought as photo only as well as ready framed. We are also able to offer all our photographs on canvas up to a super large size of 24x16 inches.